Hey everyone! I've got a recent release from Dollish Polish for you all today, and I definitely think it belongs on every polish lover's wish list! 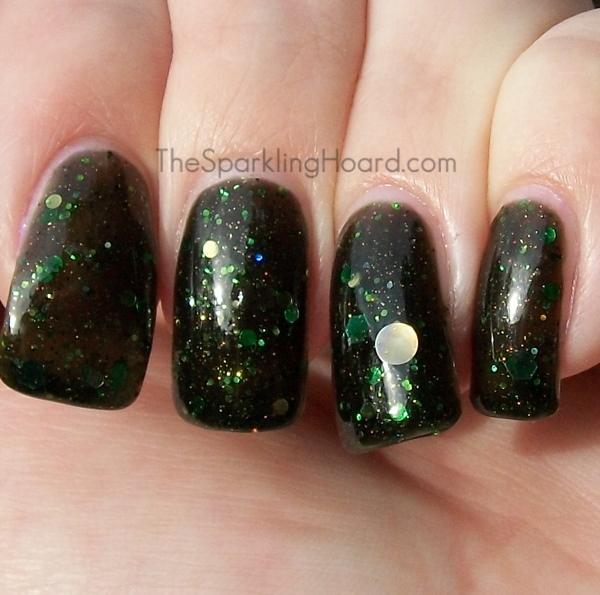 Dollish Polish Things Are Looking Very GRIMM is a black jelly packed with varying sizes and shapes of emerald and yellow-green glitter in both metallic and holographic finishes, plus some large holographic circle glitters. I was sad to discover that my bottle was a bit low on the large circles (only got 2 to come out, and couldn't see any stuck to the sides or anything), so Dolly is sending me some extra glitter to add to my bottle! The formula was fabulous and easy to control. Dry time was average. I used three coats, which, while not entirely opaque, covered to my satisfaction and provided lots of depth and "squishiness." One other thing I'd like to mention is that Dolly is now using square bottles with big, square caps. The square cap is supposed to come off to reveal a smaller cap, but I cannot for the life of me get the outer cap to come off. I'm kind of weak, so it might just be me, but I figured I'd mention it. Dollish Polish nail polishes cost $10 for 15mL or $5 for 9mL and are sold on the Dollish Polish website, Llarowe, Overall Beauty, and Edgy Polish. New and popular shades can sell out fast, so to stay-up-to-date on restock info/new colors/etc, Like the Dollish Polish Facebook page and be sure to follow your area's stockist as well! What do you think? Are you as obsessed with those big, holographic circle glitters as I am? Are you able to separate the square cap from the inner cap? Yes! 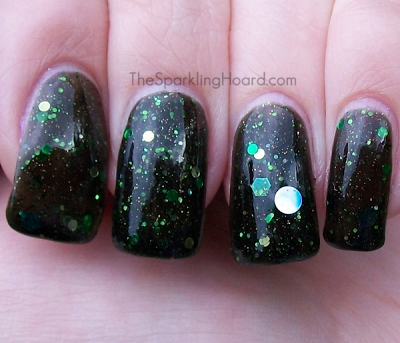 I'm in love with big round glitter! 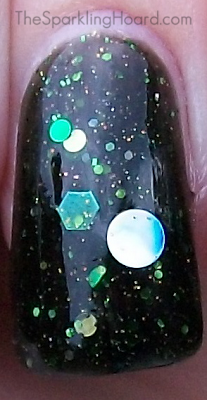 This polish looks amazing. These big holo circles are like, the best thing to come to the indie world in a while haha. Gorgeous! Also, the square cap is supposed to come off?!?! It sure doesn't seem like it, haha. Round glitters are s dreamy! It's super gorgeous, so much depth! And supposedly, yeah, but I can't get it to work lol.